This announcement that is being disseminated contains the great dharma of zen (dhyana in Sanskrit but generally known as zen) practice that H.H. Dorje Chang Buddha III taught a group of cultivators in March of 2013 in the Hall of the Three Holy Ones at Bodhi Monastery in the United States. Today is December 4, 2013. We now for the first time formally publish this great dharma on the internet. Today H.H. Dorje Chang Buddha III performed an initiation and transmission involving necessary mantras in the practice of zen. Additionally, this great dharma enables everyone to understand what the standard, proper practice of zen actually is. 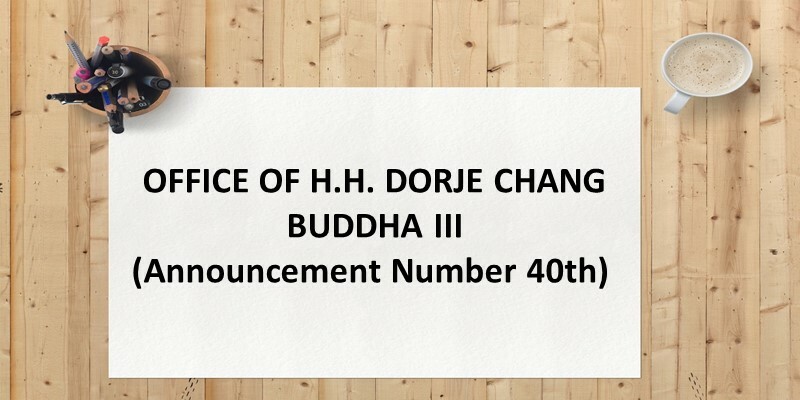 All of you will now be able to understand what the levels of those zen practice dharmas you encountered before this announcement actually are and whether such dharmas are correct. This great dharma will enable you to know whether those masters who teach you are qualified to give discourses on the dharma. Are those masters clear about what the practice of zen is? Are they clear about what zen practice is in the entirety of the Buddha-dharma? If one does not even understand zen practice, can one understand the Buddha-dharma? If one does not understand zen practice, one of course does not understand the meaning of zen. One also does not understand the meaning of samadhi. Thus, just the fact that one does not understand the meaning of zen practice shows that one does not understand Buddhism at all. Correspondingly, it shows that one also does not understand the Buddha-dharma.